Too many twentysomethings are driving through the twists and turns of their 20s with windshields covered in mud, lies, and half-truths. And then we wonder why so many of us have crashed? We need to hose these lies off right now or spend our 20’s stuck on the side of the road. 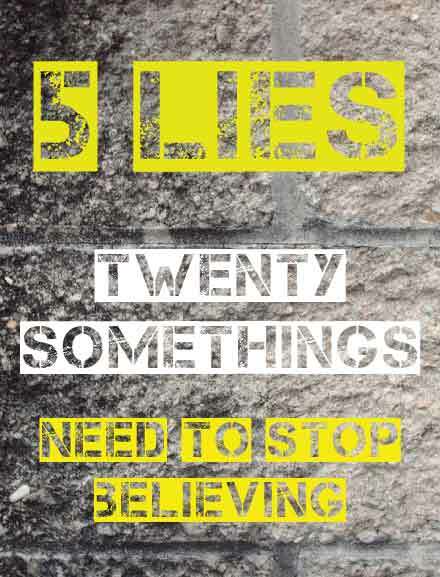 5 Lies Twenty-Somethings Need to Stop Believing. Right! Now! If you’ve read much on All Groan Up, you know that I’d love to lock this lie away in a Siberian prison and give the key to a pack of Arctic wolves to defend. You are not alone in your struggle, questions, wondering what’s next?, now what?, or do I have what it takes? Our 20s are tough. That’s the truth. Too many twenty-somethings are struggling through a quarter-life crisis all alone. We all need help. We all need support. We all need nudges, prompts, advice, and encouragement. The twenty-somethings who think they do are the ones in for the biggest shock of them all. I fully expected to walk straight into a crazy-successful twenty-something life with accolades, salaries, bonuses, a big-ol-fat-book-deal, and a plethora of people who wanted to learn my secrets to success, all by 23 years old. Maybe 25 if I really hit some serious setbacks. I didn’t realize that success takes time — loads of time. No, success is the Sistine Chapel — it takes years, pain, frustration, thousands of brushes, colors, and crumpled up sketches before you have your masterpiece. Countless famed figures we idolize, like Abraham Lincoln, failed drastically in their 20’s. Success is not a sprint, it’s an Ironman marathon and our 20’s aren’t really about running the actual race. No, our 20’s are simply about building our endurance so that we can run the race in the future. If you take one step towards your dream today, you are a success. Success happens in the details. Well, kind of. Yes, life is not turning out like it was supposed to, but what the heck is supposed to? There is no supposed to. Supposed to is a lie. Supposed to is built on the perception of someone else’s perceived success. Live your life right now exactly as it is and do your best to keep moving forward into where you want to go. That’s what you’re supposed to do. I 100% guarantee you have what it takes. I triple-stamp a double-stamp, 100% money-back guarantee you have what it takes. It’s just going to take some time to figure out what exactly “it” is. Our twenties are a process not a surprise party. You don’t just walk into the door and all of the sudden your calling jumps out from behind the couch. You’re extremely talented at something. We just need to start pulling off the layers to get a glimpse of what that something is. The only failure of our 20s would be if we never had any. The only failure of our 20s is if we fail and then call ourselves failures. Our 2os are going to be riddled with failure. Anyone that tells you otherwise is a liar. There’s only one way to be successful in our twenties — fail, tweak, then try again. What lie is holding you back?